Sydney Staff for BDS has made the following response to the Vice-Chancellor’s email of March 19, in which he singles out anti-Semitism as the trigger for the University’s investigation into the student protest at the March 11 lecture by Colonel Richard Kemp and its sequel. 1. We note that Dr Spence’s email follows public criticism of our members in the conservative media. Furthermore, we note that the accusations made against us have been comprehensively debunked, and we refer readers to the meticulous account of the March 11 event published by Michael Brull in New Matilda, and the video-evidence it contains. 2. It is clear that the present charges of anti-Semitism form part of a vexatious and politically-motivated campaign against supporters of Boycott, Divestment and Sanctions tactics for peace and justice in Israel-Palestine. 3. We also note that while it is conducting an investigation to address baseless accusations of anti-Semitism, the university has not announced any enquiry into the very real, and documented, acts of anti-Arab racism and physical assault, which also took place at Kemp’s lecture, and on account of which the police were called by us. 4. To judge from the Vice-Chancellor’s email, the terms in which the investigation has apparently been framed reinforce the very racial discrimination and prejudicial treatment to which the University says it is opposed. We further note that the perception of the discriminatory treatment of Muslims that will result risks seriously damaging the University’s standing in the Muslim and the wider community, and weakening the effectiveness of the university’s participation in anti-racism initiatives such as the “Racism. It stops with me” campaign. 5. The University should be a place of free enquiry, open political debate, and freedom of speech. University management should not therefore be in the business of conducting untransparent, ill-defined and inquisitorial investigations into the activities of its staff or students. As a result, we call on it to make public the specific terms of any investigation it is currently conducting into the events of March 11. 6. We also call on the University to treat its Jewish and Muslim staff and students transparently and equitably. We note that while Colonel Kemp’s lecture was allowed to go ahead, the Muslim Students’ Association was prevented last year from hosting Uthman Badar at a campus Q&A. SSBDS disagrees with Mr Badar’s position on a number of questions, but we believe he has the right to appear on campus, as did Col. Kemp. If people do not like what he has to say, they are within their rights to protest disruptively at his campus appearance. 7. Sydney Staff for BDS did not choose to disrupt Kemp’s talk, but we support the protesters’ right to do so. Disruptive protest is a central democratic prerogative; far from being inconsistent with free speech, it is an instantiation of it. 8. We note that while Kemp’s appearance was publicized in Jewish community media, it was not advertised in any university forum. We conclude that, as a result, the talk had the character of a political meeting, and was not an activity that benefits from the protections that we would expect to hold at an academic occasion occurring in the context of teaching or research. This latter kind of activity we would expect to have been advertised in the wider university community. 9. We note that, by contrast, SSBDS advertises its own campus events openly and widely. We invite the Vice-Chancellor and any other interested members of staff, whatever their position on BDS, to attend our forum on April 14, “Why boycotting Israel isn’t anti-Semitic”, which will include ample time for questions and discussion. 1. Tell us a bit about your early life, being born in Haifa and migrating to Ireland. I was born in Haifa, Palestine, in 1944, before the establishment of the state of Israel. My parents came to Palestine from Bucovina, northern Romania, my father in 1926 as a boy of 13 and my mother in 1940, as a 20 year old; many members of her family were deported by the Romanian fascists to Transnistria and some perished. My British Mandate birth certificate lists my parents’ nationality as ‘Palestinian’, but of course this does not make me a Palestinian. I grew up in the State of Israel in a Zionist family and there was nothing in my education that made me question Zionism. I did not serve in the army (for medical reasons, not my choice at the time) which thankfully made me different to most Israelis. I studied at the Hebrew University, but did not complete my first degree for a variety of reasons. My ‘road to Damascus’ moment happened shortly after the 1967 war when I followed Matzpen, the first anti-Zionist socialist group to analyse Israel as a settler colonial imperial power and to speak about the dispossession of the Palestinians in the 1948 Nakba. By that stage, I was no longer a Zionist. In 1968 I joined the newly founded Israel Television, where I met my husband, television director Louis Lentin, with whom I migrated to Ireland in 1969. I worked in television and in journalism before I embarked on a late academic career, working as a lecturer in sociology in the University of Dublin, Trinity College, where I founded a masters programme in Ethnic and Racial Studies (later re named ‘Race, Ethnicity, Conflict’), teaching Race Critical Theories and Gender and Race. I published extensively on Israel-Palestine, gender and violence, and race and migration in Ireland. 2. How did you come to be involved in the Palestine solidarity campaign, and why do you feel it’s important for others to do the same? I formally joined the Ireland Palestine Solidarity Campaign only recently, although I was active in debating Palestinian issues and organising conferences on Palestine for many years, bringing speakers to the university, and supervising PhDs on Palestine. In 2007 I organised a conference on Palestine in a global context, the proceedings of which were published in an edited collection Thinking Palestine (Zed Books, 2008) with chapters by Ilan Pappe, Honaida Ghanim, Raef Zreik and several UK and US scholars. In 2010 I published Co-Memory and Melancholia: Israelis Memorialising the Palestinian Nakba (Manchester UP, 2010). Over the years I have written many newspaper articles and spoken publicly about the question of Palestine. I plan to get further involved with the IPSC, particularly working on the academic boycott. Recently, we have been discussing establishing a group of Jews for Palestine – I am aware of the impact made by Jewish people working for Palestine, but I am yet to be convinced about organising ‘as Jews’. There is broad public support for Palestine in Ireland culminating recently in the Irish lower house, the Senate, voting to recognise the state of Palestine (though personally, I wonder whether such recognition, despite its strong symbolic value, is actually about bringing the two state solution in by the back door). The IPSC is articulate and effective and is also clear about opposing any signs of antisemitism, of which we are accused by Israel and its representatives and supporters. In 2014 the Boycott, Divestment and Sanctions (BDS) call has emerged as a focus of debate in the National Tertiary Education Union (NTEU). The narrow defeat for BDS at the recent National Council of the NTEU indicates the potential for Palestine solidarity activists on campus to win the NTEU to a pro-BDS policy. Yet as our campaign widens among NTEU members, and gains varying degrees of institutional support, we will inevitably confront new challenges. Sydney Staff for BDS invites all supporters of the BDS call to a meeting on November 6 to discuss the state of the BDS campaign on campus and in our union, and the next steps for 2015. Goals: What should be the goals of the BDS campaign at Australia’s universities? What role can the NTEU play in realising these goals? Organisation: What sort of cross-campus collaboration do we need? How can we best share resources and information? Is it time for a nation-wide pro-BDS network in the NTEU? 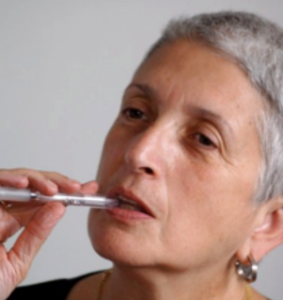 Strategy: What has been the experience of BDS activists within the NTEU so far? What approach should we take to campaign work in 2015, particularly in the lead-up to National Council 2015? We welcome all NTEU members with an interest in promoting BDS on campus. Please circulate this announcement, and bring along any colleagues who may be interested in this event. Location: University of Technology, Sydney: CB11.04.101. The room is on Level 4, room 101 in the new Engineering and IT building (Building 11, or ‘the cheesegrater’) on Broadway down from the tower. The National Council of the NTEU has narrowly missed an opportunity to add its weight to the growing support for BDS in unions around Australia. At its meeting in Melbourne on October 2-4, a motion endorsing the PACBI boycott and committing the union to initiate discussion of BDS among its membership was lost by only a handful of votes. Various reports of the count indicate a split of roughly 62 to 54, with some 6 abstentions. Facing the united opposition of the NTEU Executive, the ability of pro-BDS councillors to achieve this result shows how significantly the ground has shifted around the issue of Palestine solidarity. This debate marks the first time the issue has reached the floor of National Council since 2011. Since then a handful of branches, including ours at Sydney University, have seen discussion of BDS, but the majority have not. Many councillors confronted the question of BDS for the first time, and BDS proponents gained considerable support among this unaligned majority. Of those won to the pro-BDS position, a number subsequently expressed a desire to take the issue back to their branch. The debate at National Council confirms a point that Sydney Staff for BDS has been making all along: that although disagreement exists within the union on this question, resolving it need not be divisive. Councillors report that the opposing motions on Israel-Palestine were discussed in a frank but collegial fashion, and there no reason to believe that a more inclusive debate among the membership would be conducted any differently. Opponents of BDS at the National Council sought to portray it as an issue beyond the purview of the union’s work, an abstract proposition lacking concrete proposals for implementation. This is hardly an argument against it: even as a symbolic move, adopting a pro-BDS policy would be a significant gesture in support of the Palestinians. But the truth is that BDS is far from symbolic, and there are many ways in which the union can take action in support of the boycott call. After all, winning the union to BDS is only the first step in a long campaign to force Australian universities to cut ties with Israel. The NTEU can, and should, lend moral and material support to such a campaign, as it has done in the case of a series of recent boycott and divestment campaigns, including Greenpeace’s call for universities to divest from fossil fuel companies, and the push by refugee activists for UniSuper to divest from Transfield. Clearly Israel’s mid-year assault on Gaza has given fresh impetus to this campaign. It would be a grave mistake, though, for the NTEU to wait for the next bloody pogrom before taking a further step towards BDS. Can there be any doubt now that consensus is forming around the need for an institutional boycott of Israel? Surely it is only a matter of time before our union joins this consensus. Those arguing against BDS at the National Council stated that BDS is inconsistent with the Education International position on Israel-Palestine, which the NTEU has previously endorsed. Yet such appeals to the authority of a remote Educational International bureaucracy will ring increasingly hollow as events in the Middle East expose the ineffectiveness of Education International’s “balanced” policy. In light of the close vote, and the growing support for BDS it represents, the NTEU leadership would be well advised to take the matter in hand, and not seek to stifle debate on BDS. A process of union-wide discussion and voting on BDS in the lead-up to National Council 2015 is the best way to proceed. Whether or not the union’s leadership takes such steps, BDS supporters in the NTEU have an opportunity to capitalise on this success at National Council, and spread the campaign at the local level. Such work is essential if a pro-BDS policy in the NTEU is to have any teeth: experience shows that top-down resolutions on an issue such as this will remain a dead letter if a body of active support has not been cultivated at the grassroots. There is momentum around this issue that has not existed for some time, and good reason to believe that 2015 will be a year of BDS breakthroughs on campus in Australia. 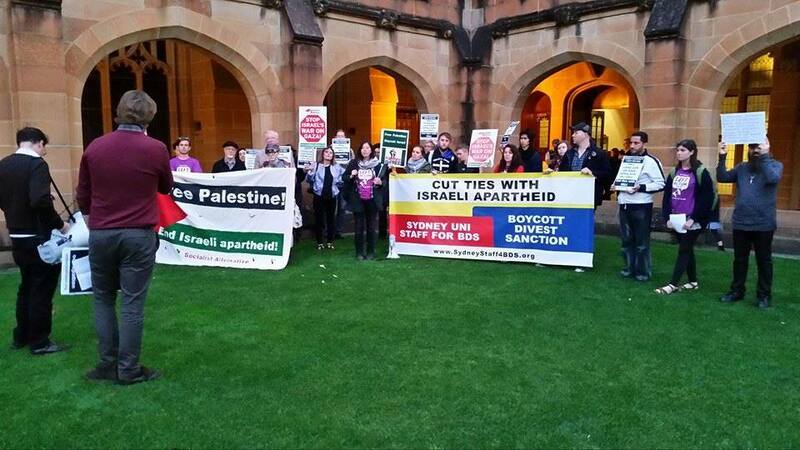 To build on this important development, members of Sydney Staff for BDS invite BDS activists in the NTEU to a cross-campus meeting at Sydney University on November 6. Details to be advised. On behalf of Sydney Staff for Boycott, Divestment and Sanctions, I want to thank you for lending your voice to those of us on campus who have been campaigning for the boycott of Israeli universities. We’re here for a few very simple reasons. We’re here because we refuse to remain silent while Sydney University celebrates its ties with the Hebrew University of Jerusalem, an institution deeply complicit the recent massacre in Gaza, or celebrates the Zelman Cowen fund that facilitates those ties. We’re here because we believe that an institutional boycott is an effective means of putting pressure on Israel to treat the Palestinians with decency. And we’re here because we believe that Sydney University has an obligation to act ethically in its connections with the rest of the world, as do all Australian universities. We reject the view, articulated by vice-chancellor Spence, that our university should not adopt a position on pressing global issues. I believe that view is incompatible with a university’s responsibility to uphold ethical standards in the work that it does. But in this case we need not even take a position on Israel. All we need to do is ask a very simple question of our partner in the Zelman Cowen Fund, a question that we should surely ask of all of our partnerships. It’s a very simple question, to which many people in Maclaurin Hall tonight would no doubt assent. That question is this: Do you, as a university, from the top, consciously and deliberately lend support to the perpetration of human rights abuses? If the answer to that question is yes, then I believe grounds for a boycott exist. Now some may say that this casts the net too widely, that this would lead to a boycott of a great many institutions in repressive regimes around the world. Sadly there is some truth in this. So I think there’s a second question that needs to be asked: Is there a credible campaign, on the part of those directly resisting these human rights abuses, that is calling for a boycott? That is to say, can our boycott here at Sydney realistically be seen as contributing to a growing campaign to end this conflict? Sydney Staff for BDS (SSBDS) will join three other Palestine-solidarity organizations in protesting outside a fundraising dinner at Sydney University on Wednesday. The $120 a head dinner will be held in the MacLaurin Hall at the university to celebrate the work of the Zelman Cowen Universities fund (ZCF), which organises and funds exchange scholarships and research partnerships between the Hebrew University of Jerusalem (HUJ) and the University of Sydney. Organisers say the aim of the protest is to exert pressure on Sydney University to cut ties with Israeli academic institutions, in line with the call for the academic boycott of Israel, part of the international Boycott, Divestment and Sanctions strategy initiated by Palestinian civil society. Earlier this year, SSBDS wrote to academics involved with the ZCF, outlining the rationale for the boycott and inviting them to withdraw their support from the fund. Endorsed by the Coalition for Justice and Peace in Palestine, the Palestine Action Group and Jews Against the Occupation, the protest will draw attention to the connections between ZCF and the Israeli occupation of Palestinian territory and the systemic human rights abuses and violations of international law it involves, most recently the war in Gaza, responsible for the death of more than 2000 Palestinian people. The chairman of HUJ’s board of governors is Michael Federmann, Chairman of Elbit Systems (Israel’s largest privately owned armament maker), one of two main providers of the electronic detection fence in the West Bank. In line with their commitment to the principle that ideas must be given political expression if they are to play a role in the real world, protest organisers intend to demonstrate outside the MacLaurin Hall from 5.45 on Wednesday September 17. There is no intention to disrupt the dinner itself. We should have been assembling a few blocks down the road outside the Verona cinema, so we could protest outside the cinema. But now the police and the courts have banned us from doing that. The court apparently doesn’t think the right to protest is important enough to justify the same traffic arrangements which would easily be made for a burst water-main or a broken-down bus. This should be of real concern to everyone committed to political freedom in this country. The right to free political expression is a cornerstone of a democratic society. The decision to outlaw it is a step down a dangerous road, at the bottom of which looms a darkly blinking police-state. Our demonstration was called to defend Palestinians’ right to justice and political freedom. In a far less acute way, we now find ourselves having to defend our own. Some people might ask what the fuss is about, given that we’re demonstrating here now. But let’s be clear about what the effect of the court decision has been: the state has sheltered the principal audience of our protest from our demands. For the Israeli dignitaries who’ll be gracing the event with their presence, they’ve tried to make it like we’re not even there. They’ve also succeeded in suppressing our numbers and in affirming that the police have the power to shut down public demos that it doesn’t like. It’s now up to us to make sure that this attempt to silence us doesn’t succeed. Attacks on fundamental freedoms don’t come with a sign saying “Danger: attack on civil liberties inside”. Freedoms like the right to protest aren’t swept away in obvious full-frontal attacks – they’re eroded step by step, with each further one carefully cocooned in the reassuring idioms of legal rationality, administrative sobriety and respect for basic rights. That’s exactly what we saw in the Supreme court this week. We condemn it, and condemn it unreservedly. The court’s decision follows the banning of three Gaza protests in and around Paris last month. It also comes in the context of tightening restrictions on the right to protest in Australia. Victoria and Tasmania have both recently introduced laws which substantially restrict protesters’ rights. These are unacceptable – and again, it’s up to us to stop them. We should call on everyone who’s committed to political freedom in our society to join us in decrying the court’s decision. But we can’t let this outrageous affront to democratic rights make us forget why we called this demonstration in the first place. It’s easy to criticise calls to boycott a film festival. But let’s be clear why we’re here. We are here to protest against official state-sponsored cultural festivals like this one, which use films to cloak the reality of Israel’s policy towards Palestine. The Australia-Israel cultural exchange, which is backing the festival along with the Israeli embassy, was opened by Netanyahu in 2002 – the same Netanyahu who now has the blood of more than 2000 Palestinians on his murderous hands. To our critics who ask us why we can’t leave cinema alone, we’ve got a question. How many would-be Palestinian directors, actors and audiences have been slain by Israeli missiles? What prospect is there for a real film industry in a culture strangled by war and occupation? So don’t lecture us about how film has the power to foster dialogue. You can’t have a dialogue when there’s a gun pointed at your head, or when there are IDF missiles trained on your houses and your family. At the moment, the films that best advance the cause of justice for Palestine are the ones that Israel wants to ban, not the ones it wants to promote. The film that’s being screened tonight is called “Self Made”. In the trailer, there’s a shot of the brutal separation wall that encloses Palestinians, like animals in a zoo. On the wall’s clear surface, there’s been painted a large bunch of sunflowers, which the camera lingers over lovingly. We know that that wall means deprivation, enclosure, and death. But for the film, it’s a canvas to paint with flowers. For me that’s like an image for what Israel’s doing with film festivals like this one – it’s trying to hide the killing, by promoting works that it hopes will make us to forget about the bombs, the rubble, the oppression of an entire people. The best thing we can do for peace in Israel-Palestine isn’t passively consume films like this, but actively boycott any festivals they’re in when these are funded by the Israeli state. I’m speaking here on behalf of SSBDS, a group of staff at Sydney University who have been pressing the university to end its association with Israel. Because what goes for cinema and culture also goes for academic research: there’s no freedom to study when your people is under siege and occupation. Just as we call for the boycott of Israeli film festivals, we’re calling for Sydney University to boycott Israel’s academic institutions, which provide so much support for the occupation. We need the BDS call to get stronger and stronger. Because it isn’t sensitive and compassionate films, or high-level academic research that will bring justice to Palestinians, but a robust politics of public pressure. And that’s why we’re taking part in this demonstration today, just as we’ve taken part in every rally since the war in Gaza started. It’s more and more clear to us, as it is to so many, that the international call for boycott, divestment and sanctions against Israel represents the most powerful mechanism Palestine has to bring about a just peace. So let’s spread the boycott call, let’s demonstrate against official Israeli events like the film festival, with even greater energy than ever. The police and the courts can try and ban us all they want, but they will never silence us. This is the right side of history. The calls for justice and peace for Palestine will not be stifled. Palestine will be free, and it’s ultimately our choice, in this international movement we belong to, how quickly that will happen. A protest against the opening night of the Israeli Film Festival will be held at Taylor Square at 5.30pm on Thursday, despite today’s judgement in the Supreme Court of NSW. Protest organisers have condemned the court for upholding NSW Police’s decision not to facilitate the protest, which was originally called outside the Palace Verona Cinema in Paddington, the cinema hosting the festival. In handing down his decision on Wednesday, the Supreme Court’s Justice Hidden stressed that the courts do not have the right either to ban or to authorize protests. All the court has done is remove the immunity from prosecution that participants would otherwise have if disruption to the road is caused. Nevertheless, today’s decision has effectively banned the protest from going ahead in the form the organisers had chosen. Today’s decision recalls the banning of a protest against the Gaza war in Paris last month. It comes in the context of tightening restrictions on the right to protest in Australia. Victoria and Tasmania have both recently introduced laws which restrict protesters’ rights. Legal representation for the Israeli Film Festival protest was provided by the NSW Council for Civil Liberties. Organisers have decided that Thursday’s protest to draw attention to Israel’s ongoing war on Gaza will assemble at Taylor Square at 5.30pm. Israeli attacks have now killed over 2000 Palestinians, including a woman and a child in one attack on Gaza City late on Tuesday. Human rights supporters continue their call for a boycott of the Israeli Film festival, despite NSW Police seeking to ban the protest planned for the opening night of the event on Thursday 21 August at the Palace Verona Cinema in Oxford St, Paddington. Despite the notification being lodged with police within the stipulated time frame last Thursday 14 August, police lawyers sought an adjournment today, Monday August 18, in the Supreme Court of NSW to enable them to prepare documentation. This was granted till Tuesday 19 August. In the wake of the latest horrific attack on Gaza and the death of some 2,000 Palestinians (many of them civilians and children), a coalition of Australian groups seeking justice for Palestinians have called on the Palace cinemas to end their support for the Israeli Film Festival. The film festival is sponsored by the Australia Israel Cultural Exchange (AICE) – a body supported by the Israeli government and sponsored by the Israeli Embassy in Australia. “AICE’s activities, including this film festival, are part of a deliberate public relations strategy by the Israeli government and its supporters to present Israel in a favourable light and to disguise its oppressions of Palestinians and theft of their land,” said Vivienne Porszolt, from Jews against the Occupation Sydney, one of the groups organising Thursday’s protest. “Over 1000 people have signed a petition calling on Palace cinemas to cease their association with this Festival, which is directly linked to and funded by the Israeli government via their Embassy here. 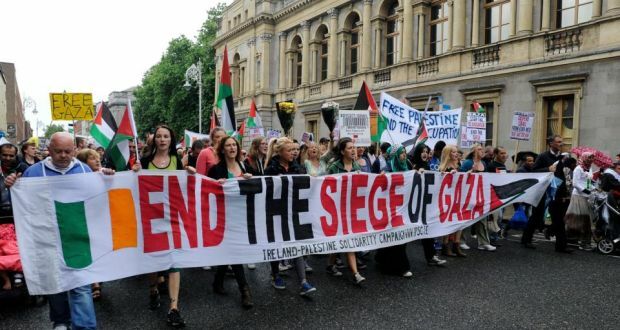 As such, it is a vehicle used to whitewash the crimes that this government is responsible for,” added Ophelia Haragli, another protest organiser, from the Sydney Palestine Action Group. “In line with the call from Palestinian civil society for a global cultural, academic and economic boycott of Israel, Australians are increasingly supporting the BDS strategy as a lawful, non-violent and effective strategy that people of the world can use to defend Palestinian rights,” said Nick Riemer from Sydney Staff for BDS, a University of Sydney staff group that promotes the boycott of Israel and is helping organise the protest. Organisers are planning a peaceful and lawful demonstration on Thursday evening. They condemn the police’s effort to deny their freedom of assembly and expression. Organisers have stressed that the protest is against an activity sponsored by the Israeli government and local supporters. It is in no way against Jews or Israelis as such. “Where Western governments, especially the US and our own government in Australia have totally failed to hold Israel to account, indeed have supported their defiance of international law, civil society is obliged to act,” said Damian Ridgwell from Palestine Action Group. At today’s Sydney University branch meeting of the National Tertiary Education Union (NTEU), members overwhelmingly endorsed a motion presented by Sydney Staff for BDS, condemning Israel’s assault on the Gaza Strip. The motion clearly identifies Israel as the aggressor in this conflict, and points to the need for Israel to abandon its oppressive policies in order to achieve peace. After the NTEU voted earlier in the year to curtail discussion of the Boycott, Divestment and Sanctions strategy to combat the Israeli occupation, this resolution marks an important step forward in promoting the cause of Palestinian justice on campus. affirms its support for political negotiations between democratically elected leaders in the Middle East to reduce violence, promote human rights and ensure compliance with international law in the region.